Chris Rusk is the head pro at Savannah Golf Links in Cambridge. He drives to work each day over the rolling hills, through twists and turns up Cheese Factory Road (probably pinching himself), knowing that when he arrives at his pristine destination, he will embrace his life’s calling. “How could I not love what I do? Each day, 99% of the people I meet and greet, show up ready to have a good time. I’m not chained to a computer screen, and I don’t have to crunch numbers that I have no interest in,” admits Rusk. It’s easy now, in retrospect, but things could have turned out quite different had he not listened to that quiet, nagging voice in the back of his head. Rusk, like so many other students entering post secondary school life, hadn’t a clue what he wanted to do let alone what he hoped to become. He had an aptitude for numbers and demonstrated a strong business sense, so he enrolled in what would eventually lead him into the arena of economics and financial management. He graduated with distinction at the head of his class without knowing where it might lead him. But would it mean trudging down the road sporting his financial attaché and laptop, in pursuit of a career that would see him manage other people’s money? Would he climb the ladder in the skyscrapers of the financial district, to obsess about the bottom line, in constant quest of the coveted bonus? Would he be required to master the art of small talk, to chortle and to morn the fate of the last associate who was walked to the door, with no chance to clear out their desk, given the pink slip, a dishonourable discharge, as punishment for following their own path… a direct violation of corporate policy? Was there passion here? For many, unquestionably, yes! Did Chris Rusk share this passion? Unquestionably, no! This is not to say that he did not want to fare well financially in life, he did. But to do so he would first need to bid farewell to the financial services industry. This would not be his legacy or a swan song of which he wanted to sing praises. Following graduation, it made perfect sense to work within the industry he trained for. Chris landed a three month contract with a financial institution as an investment customer service representative. While he did his job with great proficiently, he quickly became painfully aware that he didn’t do “cubicles” well. In recent years, there is no denying that minions have become exceedingly popular and a cash cow for the film industry, however, towing the corporate line to make other people’s ends meet the expected returns with record breaking, year over year, financial regularity did not interest him. Interest earning is necessary, praiseworthy and applaudable …but was it interesting? Not to Chris. And so Rusk took a bold step in a new direction, presented himself with a pink slip, emptied his desk into a banker’s box and walked himself out of the building. In the mean time, as luck would have it, a job opening became available at a local golf facility. Of course, this was not a real job because, after narrowly escaping a life of boredom at his last position, something which combined both skill and pleasure could only be considered a dalliance on the road to something more respectable and long term. 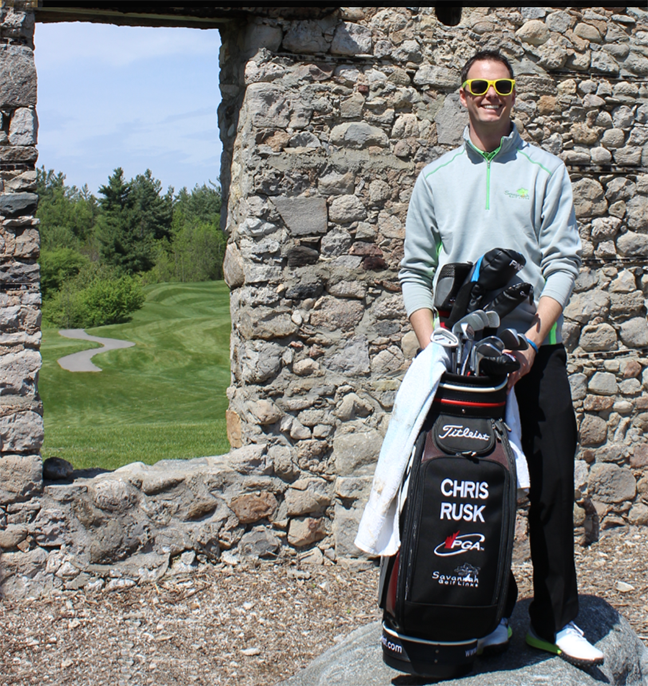 Garrett Burridge, CPGA Professional and General Manager at Puslinch Lake Golf Course needed help in the Pro Shop over the summer and Chris jumped at the chance to grab the job and get into the swing of things in the making-a-living department. As it turned out Garrett was a multi tasker and micro manager in the very best sense of the term. In short, he did it all. He oversaw the workings of the entire facility from top to bottom and sideways…and over the next 7 and a half years, Chris would come to learn to do it all. But the other half of this career building equation was that Chris would also fall in love with the game of golf and become a pro in his own right. He had finally found his personal sweet spot...he had finally found his passion. Back in the 90’s when the golf industry was under serviced, and perceived an elitist past time, John Medeiros was a self-employed electrical contractor in Cambridge. Along with his wife Paula, they worked long hours as a team in the construction industry building homes and partnering with other construction service providers. 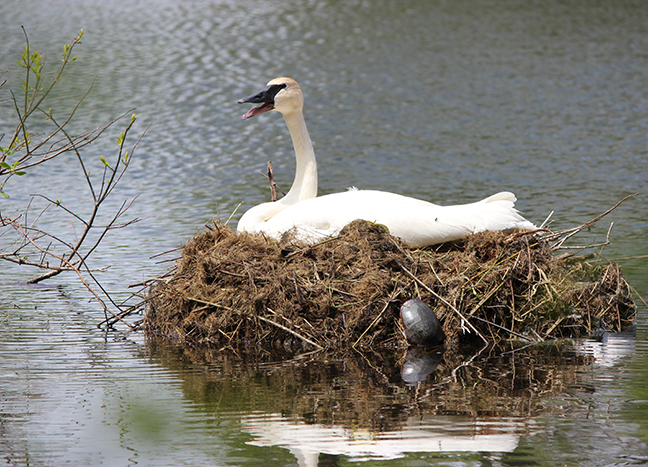 They did well, and they had amassed a sizable nest egg. While he had developed a great respect for his electrical vocation, he just didn’t get a charge out of going to work every day. Once again, something was missing. And once again the word PASSION rises to the top of the list…like cream rises to the top of a bottle of milk. THEN, as if struck by lightening, John Medeiros had a dream—golf course ownership. The scary part was that he wasn’t even really a golfer at the time, however, the notion of personal freedom and the lure of the links could not be suppressed. But to build a golf course from scratch was no small investment, even in the 90’s. They had found the perfect piece of rambling rolling paradise out on Cheese Factory Road. It had been a farm for 100 years. A ragged, jagged piece of geography which had failed its owners and agricultural duty. Hundreds of Scots had arrived in this part of Canada looking for peace of mind and a piece of property which reminded them of the bonnie heaths of home. Sadly, this was not a plot which supported crops, rough grazing perhaps…But oh what a bonnie wee course it would make for the sport of golf. The land deal was struck, the architect was hired, and the planning and construction began. John’s experience in construction lead him to hire top notch tradesmen…for him it was the only way to go. Giant machines dotted the landscape and the transformation from farm fields to fairways was underway. Against the advice of renowned Golf Course Architect David Moote, John hired the construction crew on a time and materials basis. He believed that people should be paid and make a profit for the professional services they provide. It was fair and just. Moote felt it would be disastrous. The job finished on time and on budget. Say no more. Savannah Links operated without an official clubhouse for a number of years. But this beautiful, tight, welcoming, golf course became widely praised for delivering a premium golf experience. When it came time to build their club house to compliment their gem, John Medeiros applied his famous construction philosophy. Do as much as you can yourself AND for the rest, hire reputable people who are at the top of their trade and pay them well. Remember Chris Rusk? The almost financial services representative who found his passion in golf and never looked back? Well, in 2011, Johnny Medeiros, the talented electrical contractor, who followed his dream and found his passion in golf course ownership, was looking for a head pro. Garrett Burridge caught wind of it and recommended his protégé Chris Rusk. The guy with a sponge for knowledge had been groomed by a pro and was ready to take flight. It was a partnership ripe for the picking. Two people passionate about the same industry, both sticklers for details, and not satisfied until the best possible golf experience is delivered to each and every guest who makes their way down Cheese Factory Road. The relationship works. While more and more independent golf courses are selling to the chain conglomerates, many because of lack of passion and lack of profit (one impacting the other), Savannah Links continues to be a family owned phenomenon on solid financial ground. But it’s never been all about the money. The people who golf at Savannah Links know why they come here. People fall in the love with the peacefulness and the belongingness. They drive great distances just to be there…and they return with great regularity. Savannah’s men’s and women’s leagues are widely praised and popular as are the season long special events and social activities such as 9 and Dine evenings which begin with a shotgun… and sees everyone sitting down to dine together. As it should be. This doesn’t happen by accident. 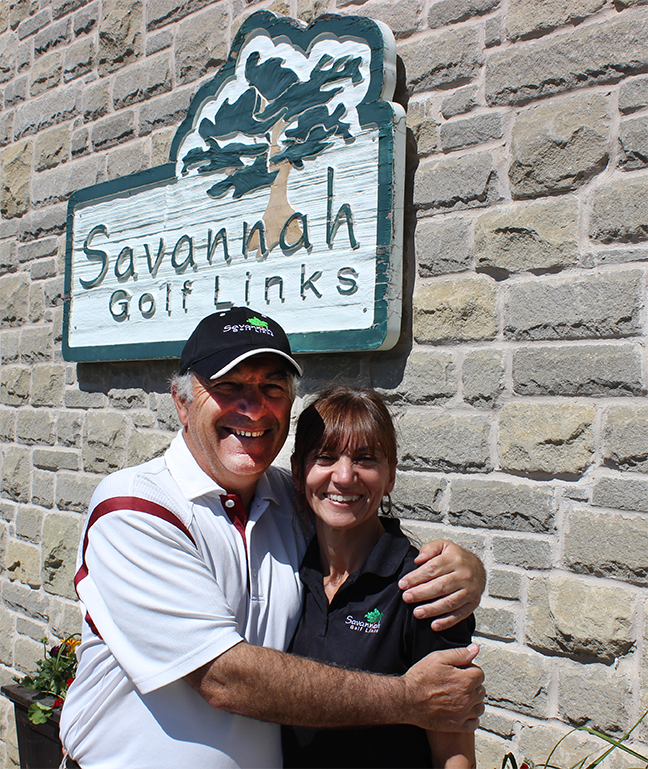 John, Paula, Chris and the whole Savannah Links team believes that it’s not just about the quality of the game…it’s about the participants, a sense of belonging, and most of all, it’s about the PASSION which brings people together in the first place. Visit Us Soon And Play Savannah Golf Links...Come For The Passion...Stay For The Golf. Walk Or Ride ...It's A Beauty You Won't Soon Forget.